Baobab, a staple and sacred plant in its native lands, is garnering attention from around the world thanks to its extensive health benefits. 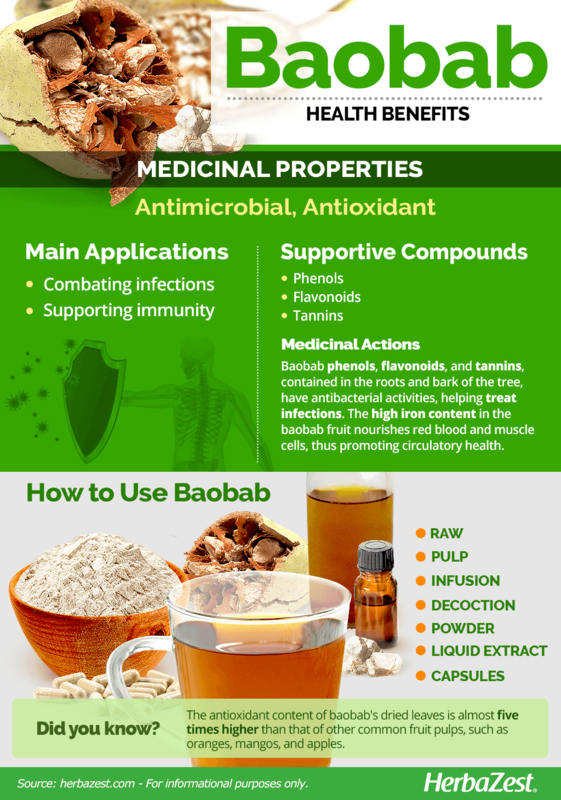 Baobab is slowly gaining popularity in the medicinal and culinary world. It is packed with high amounts of protein, carbohydrates, energy, and fiber, as well as essential vitamins and minerals. Combating infections. Several organic compounds within the bark have been found to treat microbial infections in humans and animals. Supporting immunity. The antioxidants and high vitamin C content strengthen the immune system by enhancing white blood cell activity. Additionally, the high iron content in the fruit nourishes red blood cells and muscle cells, thus promoting circulatory health. Traditionally, baobab fruit, leaves, and bark have been used to help treat malaria, coughs, fever, diarrhea, dysentery, asthma, and bladder diseases. Phenols, flavonoids, and tannins are the key compounds responsible for many of baobab's health benefits. These organic compounds, which can be found in the bark, are responsible for baobab's antibacterial activity, helping treat infections. Root and stem bark extracts have proven to inhibit the growth of various microorganisms. Moreover, phenolic and flavonoid compounds of the dried leaves are to credit for baobab's strong antioxidant action. It has been found that the antioxidant content of baobab's dried leaves was almost five times higher than that of other common fruit pulps, such as oranges, mangos, and apples. The leaves are also a good source of iron, which makes up about 70% of hemoglobin, red blood cells that transfer oxygen, and myoglobin, muscle cells. Depletion of iron stores can lead to iron-deficient erythropoiesis and, eventually, anemia. Lastly, baobab's fruit pulp contains high levels of vitamin C (ascorbic acid), almost three times higher than oranges. Vitamin C is water-soluble and essential for normal body function. Because it is not stored in the body, it must be obtained daily from one's diet. Vitamin C helps strengthen the immune system by stimulating the defensive action of white blood cells against invading pathogens. Vitamin C also plays a role in collagen synthesis by helping with the repair and growth of tissues, cells, and blood vessels. This ensures proper healing times after injuries and illnesses. The baobab fruit also contains many valuable nutrients, such as protein, fiber, vitamin C, vitamin B6, calcium, phosphorus, and iron. Other herbs with antimicrobial properties are marsh mallow and thyme, while carambola and chia share similar antioxidant effects. Baobab is most likely safe when consumed in moderation as a food. However, due to its high fiber content, over-consumption of baobab may have a laxative effect. So far, there is no evidence of allergic responses caused by the topical or internal use of baobab. In 2008, the Food and Drug Administration (FDA) labeled baobab fruit pulp as Generally Recognizable as Safe (GRAS), for being used in blended fruit drinks and fruit cereal bars. There is no current research available about the safety of baobab when used medicinally or regarding drug interactions. Baobab offers an exotic addition to any meal while providing a myriad of nutrients. It is commonly sold in powder form, which makes it easy to add to smoothies, yogurt, drinks, and baked goods. African natives have been known to pound the fruit pulp into pancakes and dry them in the sun, allowing them to be stored for several months. They rely on this nutrient-rich sustenance during times of famine. Due to its recent rise in global popularity as a "super food," baobab is becoming more widely available for consumption. However, for medicinal purposes, there are a variety of preparations that concentrates the benefits of baobab. Raw. Raw baobab fruit, seeds, and leaves can be used in soup or roasted as snacks. Pulp. In India, the pulp is mixed with buttermilk to relieve diarrhea and dysentery. Infusion.The leaves of baobab can be steeped in hot water to make a tea or infusion that is also believed to help fight asthma, fevers, inflammation, and diarrhea. Decoction. Leavesand fruits are traditionally boiled, and the concentrated liquid is ingested to heal ailments such as diarrhea, gingivitis, fevers, coughs, wounds, and kidney and microbial diseases. Powder. Powdered baobab is typically added to food products, such as cereal, baked goods, or drinks. Baobab pulp powder is also mixed with beverages as a nutritional supplement. BAOBAB SEEDS, WHICH ARE RICH IN PROTEIN, CAN BE ROASTED AND EATEN AS A SNACK LIKE NUTS. Liquid extract. An aqueous extract can be made from the bark to aid with anemia. Capsules. Supplements of baobab powder can be taken to benefit from the fruit's many vitamins, minerals, and nutrients. Baobab is typically consumed in its powdered form, but the fruit pulp is also processed to make wine, gin, and confectionery. Raw baobab fruit, seeds, and leaves are also popular ways of consumption. Although they may remain somewhat hard to find across most of the Western world, those who live in large cities may find them in specialized ethnic markets or through online herbal shops. 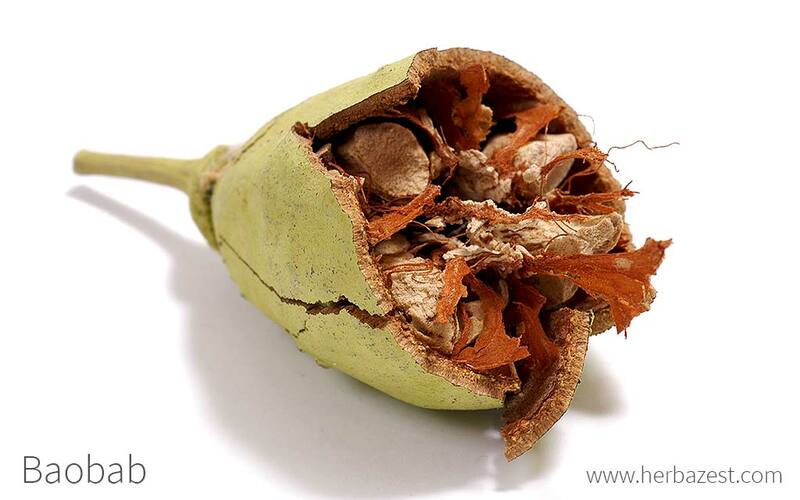 Dietary supplements of baobab can be found online or at specialty health stores, typically as capsules and extracts. Baobab trees typically thrive in Africa, Madagascar, and Australia, in tropical climates and desert areas. The hardy baobab tree can survive with very different rainfall averages, and also tolerates the prolonged periods of drought. This not an easy species to grow at home, as seedlings are slow to establish roots and are vulnerable to passing herbivores; however, if conditions are met, baobabs can be successfully cultivated. The baobab can grow on a wide range of soils, with different pH levels, as long they are well-drained and provide sufficient moisture and anchorage. The hardy baobab seeds require scarification before germinating in order to allow water absorption. Germination rates are low, and the full process may rake up to a year if not pretreated. Once they have sprouted, seedlings require full sun exposure; they will become dormant once winter arrives. The most successful baobab trees thrive in environments where they receive 200 - 1,200 mm of rainfall annually. Baobab trees are native to the grassy plains and savanna woodlands of Sub-Saharan Africa. There is no such thing as a typical baobab, as individual specimens vary. The massive deciduous tree can grow up to 82 feet (25 m) tall and 40 feet (10 m) in diameter, with a distinctive swollen trunk and irregular crown. The baobab tree bears large white or pink flowers, normally during rainy season, and its fruits that can grow to the size of melons. They will remain dangling during dry season long after leaves drop when they're ready for harvest. The fruit's gourd-like shell has a furry, yellowish-brown coating, and the pulp is mealy and dry, with clusters of seeds. The fruits store for up to three months. The baobab tree belong to the Malvaceae family and the genus Adansonia. The botanical subfamily where baobab is included is called Bombacoideae or Bombax, and comprises about 30 genera, six tribes, and about 250 species. Other well-known members of the Malvaceae family are cacao (Theobroma cacao), hibiscus (Hibiscus sabdariffa), mallow (Malva sylvestris), and marsh mallow (Althaea officinalis). Although the Adansonia digitata species has no recognized subspecies or varieties, there are eight species in the Adansonia genus, all of which can be referred to as "baobab." Six of these species are found on the island of Madagascar alone. On the other hand, the species Adansonia gibbosa is the only baobab species found in Australia. The history of the Baobab tree has deep roots in ancient Africa. It is considered the "tree of life" because of its long lifespan and myriad of uses, including the tree's ability to hold up to 100,000 liters of water in its soft, fibrous trunk. It is believed that some trees are over 1,000 years old. However, of the eight species of the Adansonia genus, Adansonia digitata was the first to be discovered and the best documented. The genus name Adansonia comes from French botanist Michael Adanson, who was the first to bring the seeds to Paris in 1754 and provided a description of the plant after a trip to Senegal. Digitata means "hand-shaped", due to the leaves' appearance. Millions of natives believe that the massive tree is sacred and possesses healing powers through its branches that stretch upward toward heaven. In West Africa, trunks are hollowed out to be used as tombs. Dead relatives are also buried at the base of trees, where it is believed that the baobab will become imbued with their souls. The baobab is one of the few trees in Africa preserved as repositories for ancestors; hence, it has spiritual power over the community's welfare. Thanks to the recent globalization of baobab products, impoverished communities in Africa have seemingly benefited. PhytoTrade Africa, a non-profit organization, has developed an efficient working system where local families harvest the baobab fruit and earn income that can help pay for healthcare, education, and everyday necessities. In addition to the international industry, baobab products are also sold regionally, thus providing income for the local population and allowing marginalized producers to be heard. Although no recent revenue figures for baobab products have been published, it is certain that commercialization of baobab products (e.g. seed oil, fruit pulp) has increased, especially after the Food and Drug Administration (FDA) and the European Union recognized the pulp as a food supplement. There is a 6,000-year-old baobab tree in South Africa that houses a pub inside of its massive trunk. Since 1933, the Sunland Baobab Pub can comfortably accommodate 15 people. Fiber. The fiber obtained from the baobab tree is used to make ropes, baskets, clothes, hats, and strings for musical instruments. Cosmetics. Baobab seed oil extract is also used in some beauty products for its high fatty acid composition. Acclaimed worldwide for their myriad of uses, baobab trees provide local and international communities a variety of nutritional and medicinal benefits. They're used for promoting circulatory health, supporting the immune system, and fighting infections among other bodily functions. From its long history to today, baobab is an up-and-coming, promising addition to any diet.